Hot-rolled steel strips are covered by a scale layer. If left, this layer impairs surface treatment, extending the time and energy required for strip pickling. 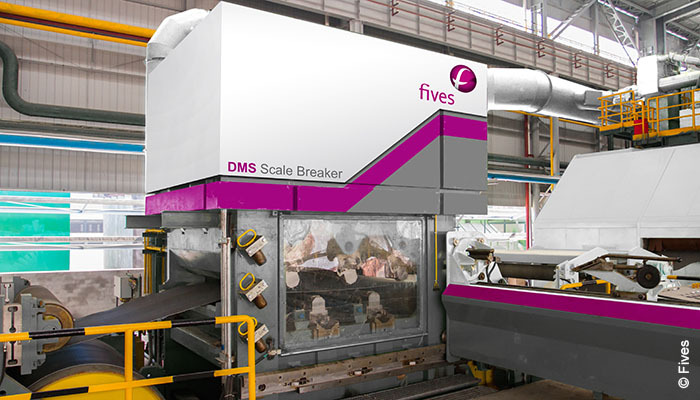 Fives developed the DMS ScaleBreaker to break down this oxidation layer and improve strip flatness, enabling faster, more efficient strip pickling. The machine was designed using finite element method (FEM) to ensure proper sizing of the frame and components to withstand very high strip tension. The DMS ScaleBreaker is heavy-duty and maintenance-friendly equipment. It features an efficient dust removal system, enabling operation in high-dust atmospheres, and operates in either dry or wet configuration, depending on your applications. 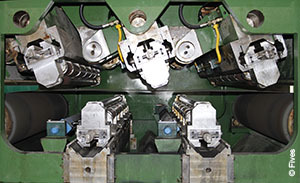 The machine also includes Fives’ proprietary quick change cartridge and anti-rust treatment. In an effort to make rolls changing operation easier, Fives designed a car system for quick and easy dismantling of the work rolls cassettes. The car is also equipped with an innovative turnaround system – fixed onto the dismantling car – for upper cassettes. The work roll can be changed immediately without handling the cassettes.